Joshua Lott/Getty ImagesRepublican presidential candidate Donald Trump gives a thumbs-up as he is introduced during a campaign event. Donald Trump raised more than $2 million in 12 hours on Tuesday, his son said. The presumptive Republican nominee had appealed to supporters Tuesday for funds, announcing he would match up to $2 million in donations. The rush of cash came after a dismal Federal Elections Commission report revealed late Monday that Trump ended May with only $1.3 million cash on hand. His Democratic opponent, Hillary Clinton, had $42.5 million in funds available — a gap that won’t be easy to close. Donald Trump Jr. appeared to acknowledge how difficult it would be to catch up to Clinton in fundraising, asking supporters to continue donating to combat the “deep-pocketed donors” backing Clinton. “If you haven’t given yet, I’m asking you to donate right now to help out the campaign at this critical time,” he wrote. 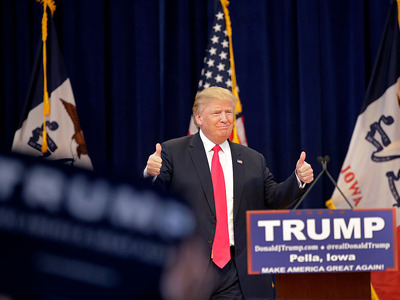 Nevertheless, Trump has, to some extent, downplayed the need to raise money. The real-estate mogul said Tuesday he could have “unlimited” cash on hand if he wanted to, since he could simply draw from his personal fortune. The New York businessman has also boasted about his “leaner and more efficient” political operation which he has noted is far less expensive than Clinton’s.